"The Creature From the Black Lagoon may seem more clich� today than it did in 1954; so many movies have borrowed from this source that it's hard not to snicker while watching it. But downshift your disbelief, turn up your camp receptors a few notches, and you'll thoroughly enjoy this film. Unlike most other 3-D pictures of its era, it is mercifully low on "throwing stuff at the audience" sequences, though seeing the film in stereo certainly adds to the not-inconsiderable beauty of the film's underwater sequences (and watch out for the plaster cast of the creature's claw!). 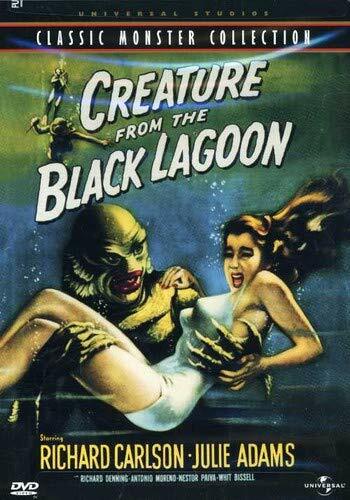 Richard Carlson is a better-than-average hero, Julie Adams is a superior damsel in distress (in a damp swimming suit), Jack Arnold keeps the story moving nicely and lays on plenty of mysterious undercurrent, and Universal Pictures knew how to make a monster when they put their mind to it. If the Creature isn't as immediately memorable as Frankenstein's monster or the Wolf Man (who were both near the end of their run when this movie was made), he easily beats out the dozens of aquatic beasts that later slithered onto drive-in screens. In an imaginative suit designed by Bud Westmore, diver Ricou Browning made the Gill-Man a graceful force to be reckoned with in the water, and Ben Chapman was even more powerful (if less mysterious) when he played the Creature on land. The Creature From the Black Lagoon was one of the last worthwhile monster movies from Universal, the studio that most enthusiastically embraced the horror genre in the 1930s and 1940s, and, even if one can tell at times that this is a past-prime horror flick, it has enough craft and high spirits to serve as a potent reminder of just how strong even their second-string stuff could be."